The future of the BOPA film market looks attractive with opportunities in the packaging, automotive, construction, and electrical & electronic industries. 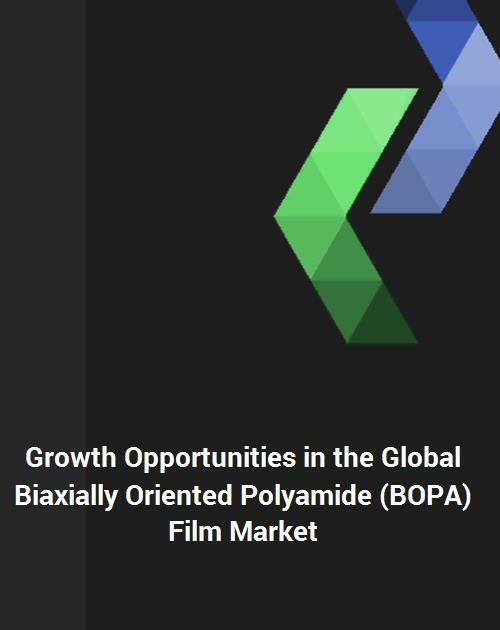 The global BOPA film market is expected to reach an estimated $3.4 billion by 2022 and is forecast to grow at a CAGR of 8.8% from 2017 to 2022. The major growth drivers for this market are increasing demand for flexible packaging due to the growth in food & pharmaceutical market and superior mechanical strength, higher transparency, chemical resistance, and excellent gas barrier properties as compared to biaxially oriented polypropylene (BOPP) and biaxially oriented polyethylene terephthalate (BOPET) film. Emerging trends, which have a direct impact on the dynamics of the BOPA film industry, include growing use of linear simultaneous stretching line (LISIM) technique and growing demand for balanced film with better dimensional stability and less shrinkage. A total of 128 figures/charts and 122 tables are provided in this 194-page report to help in your business decisions. BOPA film market companies profiled in this market include Unitika Ltd., Green Seal Holding, Domo Chemicals, Toray, and A.J. Plast are among the major suppliers of BOPA film. The researcher forecasts that the sequential process is expected to remain the largest segment due to low-cost, flexibility in the process while stretching, and high production rate. Simultaneous process is expected to witness the highest growth in the forecast period supported by the increasing demand for high value BOPA films for advanced applications, such as retortable pouches. Market size estimates: Global BOPA film market size estimation in terms of value ($M) and Volume (Kilotons) shipment. Segmentation analysis: Global orthopedic device industry size by various applications such as process, function, and end use industry in terms of value and volume shipment. Regional analysis: Global BOPA film market breakdown by key regions such as North America, Europe, and Asia & Rest of World. Growth opportunities: Analysis on growth opportunities in different applications and regions of global BOPA film market. Strategic analysis: This includes M&A, new product development, and competitive landscape of global BOPA film market. Q.1 What are some of the most promising potential, high-growth opportunities for the global BOPA film market by process (sequential, simultaneous, blown), function type (barrier, safety, microporous, and others), end use industry (food packaging, pharmaceutical packaging, other packaging, balloon, and others), and region (North America, Europe, Asia Pacific, and the Rest of the World)? Q.4 What are the key factors affecting market dynamics? What are the drivers and challenges of the BOPA film market? Q.5 What are the business risks and threats to the BOPA film market? Q.6 What are emerging trends in this BOPA film market and the reasons behind them? Q.7 What are some changing demands of customers in the BOPA film market? Q.8 What are the new developments in the BOPA film market? Which companies are leading these developments? Q.9 Who are the major players in this BOPA film market? What strategic initiatives are being implemented by key players for business growth? Q.10 What are some of the competitive products and processes in this BOPA film area and how big of a threat do they pose for loss of market share via material or product substitution? Q.11 What M & A activities have taken place in the last 5 years in this BOPA film market?